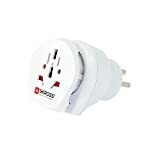 The electrical sockets used in Israel are type H. You will therefore need a UK 3 pin to type H adaptor in order to plug in your appliances. Voltage - The mains voltage in Israel is 230 V which is compatible with all UK appliances (UK voltage is currently specified as 230 V +10% / - 6%). Frequency - The frequency in Israel is 50 Hz which is the same as the UK. 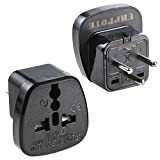 Special considerations - The standard for H plugs and sockets was recently modified to use round pins, so most modern sockets accept both type C and type H plugs. Type M sockets are used for air conditioners. Identical plugs and sockets also used in the Palestinian National Authority areas.